As the presidential race gets hotter and heavier, defenders of the right will call out the dogs to let those lefties know just what they think. Of course dogs don't have a vote, but they can bite, so you liberals better watch out. Among dozens and dozens of right wing political t-shirts for dogs, the top 10 are uniquely suited to the instinctive cleverness of a dog. Now, go gingerly ahead; these are some mean dogs! This is a great muscle shirt, which distinguishes it from the rest of the dog t-shirts among the top 10. Also, take a good look at this dog; he is one-of-a-kind. As you read on, you'll see what I mean. The Right Wing Attack Dog t-shirt is available at ThoseShirts.com in various sizes, even small. Darn you fairy vegans, I'm a dog and I don't do all that sissy stuff. And get used to my face, 'cause you're gonna be seeing it on every remaining picture in this blog. If you want to buy this Heterosexual Steak Eater Dog T-Shirt, feel free to go to PissOffTheLeft.com. "Super Hillary dodges sniper fire that isn't even there." Balloon caption: "There were Ninjas too!" Ah, I hope this t-shirt is readable from at least two feet, because I don't want to be attacked while sneaking up on this dog to read her t-shirt. This wry little shirt can be had, or purchased, at PissOffTheLeft.com. Ouch. This should get any liberal right where it hurts... but where is that? The face? Anyhow, the Ride With Ted Dog T-Shirt can be yours if you order it from Speak Up Designs. "In space no one can hear you scream for government handouts. Send Liberals to colonize the moon!" Remember, "To the moon, Alice. To the moon!" (Certainly you've seen re-runs of The Honeymooners!) 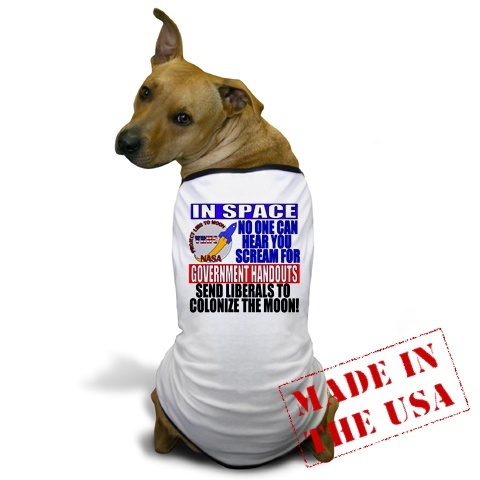 The Liberals In Space Dog T-Shirt is sold by TheRightThings.com. "Did I just see Obama being chased by Osama on a Llama?" You do not have to respong to this unless the dog sniffs you out as a liberal. Don't, whatever you do, wear an Obama button to the dog park. Righties, if you are interested in poetry, you can find the Obama Osama Llama Dog T-Shirt at Speak Up Designs. Everyone knows that American dogs don't understand Spanish, and Mexican immigrants make them ferocious. (The dog in the picture is just pretending to be calm.) If Rover's issue is immigration get him a Speak English Dog T-Shirt at PissOffTheLeft.com. Male dog righties always sense the lefties in the crowd and pee on them. It might even be worth taking your male to a Hillary rally.... The GOPee On Hillary Dog T-Shirt is available at Speak Up Designs. Tough times ahead for the former Democratic governor, former prosecutor of New York. Righties rejoice! And get the Spitzer Prostitution Rests T-Shirt for your dog from PissOffTheLeft.com. Just stop them right in their tracks before they get on their poverty, animal rights, health care, peace, and all their other crap soap boxes. Psst... Lefties! It's not a good idea to bring up these issues with "Killer" around. "Killer" can get his Liberal Crap Dog T-Shirt at Speak Up Designs. Don't you think this dog model deserves plenty of royalties for posing in Photoshop® a zillion times? (Is this a right wing idea or a left wing idea?) Anyway, thanks to CafePress, this same dog can appear in your own clever t-shirt. There are 10 more very similar-looking dogs in The10 Best Left Wing Dog T-Shirts. 10 Top Gifts For America's First Dog "Bo"
Argh, Matey, It's A Pirate's Life For Pets With Cool Toys And Accessories All Year Round!